After the Loma Prieta Earthquake in 1989 caused damage to the San Francisco - Oakland Bay Bridge, Caltrans engineers spent many months analyzing the structure before coming to the conclusion that the West Bay Crossing (a suspension bridge) could be retrofitted but the East Bay Crossing (a long steel truss bridge) needed to be replaced. 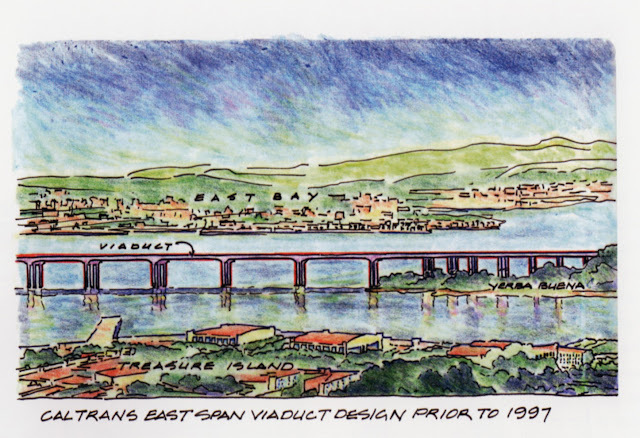 The decision to retrofit or replace a seismically vulnerable structure, repeated countless times during the big retrofit program in the 1990s, only resulted in controversy on the East Bay Crossing Project. Two recent books shed light on this project. 'Bay Bridge, History and Design of a New Icon' was written by an architect involved in the project (Donald MacDonald) with help from the writer Ira Nadel. 'Remaking the San Francisco - Oakland Bay Bridge' was written by an adjunct professor at the University of California at Berkeley in Transportation Planning (Karen Trapenberg Frick) who explores the rebuilding of the bridge as a 'MegaProject,' a strange creature that needs to be better understood. Caltrans engineers tried to make reasonable decisions for the design of this bridge but everything was amplified by the many people and groups who had an interest in the project. There were professors and consultants eager to have their ideas considered, government agencies moving the project in different directions, politicians trying to make the project benefit their constituents, and reporters looking for a big story. 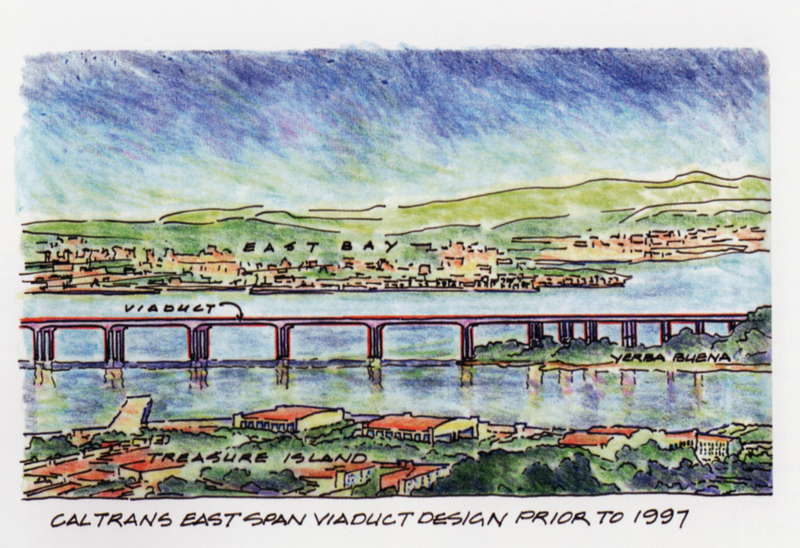 The original plan was to build a simple skyway, two miles of prestressed concrete box girder spans that provided a seismically safe structure to resist the next big earthquake (see figure above by MacDonald for his book). However, all of the different groups were pushing for a signature span for this important structure. Perhaps if Caltrans had been allowed to build their 'plain vanilla' bridge, billions of dollars could have been saved. Readers interested in studying how big bridge projects can take on a life of their own are encouraged to read these interesting books.